Electric-powered lawn mowers are starting to grow in popularity for a variety of different reasons. The fact that these machines are much easier to maintain than their gas-powered counterparts tops the list of reasons why most people choose an electric push lawn mower. While a cordless or corded electric lawn mower may require less maintenance, it still needs some care if you want it to operate well and have a long life. To accomplish this, you may need to change your lawn mower blades or recharge your machine. Since spring and summer are the times when lawn mowers get the most use, the beginning of spring is the ideal time to perform some annual maintenance on your electric powered lawn mower. This post will go over some of the steps you should take to get your machine ready for spring. They include: checking the power supply, clearing the deck of debris, changing the blades, tightening hardware, and cleaning the vents. Every lawn mower is different, so it is important to follow the care instructions that come with the machine. A corded electric lawn mower like the Worx 13 Amp Electric 20” Lawn Mower may require different care from other electric models. Some electric push lawn mowers may also have special features that require specific maintenance procedures. Before you start your annual lawn maintenance, find the manual that came with the mower. If you can’t find it, you might be able to download a copy from the manufacturer’s website. Having a safe, reliable power supply is important. Before you take your corded electric lawn mower out for the year, you should check the cord to make sure it is in good condition. This is another reason why it’s beneficial to have the manual on hand. Some manuals will have information about replacing or repairing the cord, which could be useful if you have any problems. Of course, this may be one reason that some people might choose to go with a an automatic over an electric push lawn mower. 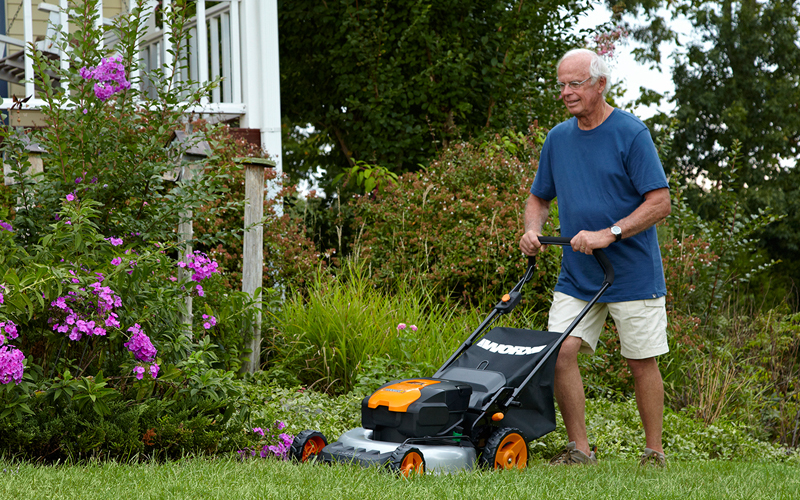 A machine like the Worx 40V Cordless Lawn Mower has plenty of power and can cover a lot of area with a single charge. Additionally, you do not have to worry about the cord getting damaged and you have more freedom with the battery-powered design than you do with most corded electric lawn mowers. Each time you mow the lawn, a significant amount of grass and debris is going to accumulate in the mower deck. Over several uses, this debris can build up and clog the machine. To clean the deck, you want to start by making sure your corded electric lawn mower is unplugged. Once you know it is unplugged, you can tip it on its side to get an idea of how dirty it is. You should be able to remove most of the grass and debris simply by spraying out the deck with a garden hose or leaf blower. If you have a lot of build-up that is hard to remove, you may need to scrub the mower deck with a wire brush. You should also clean and check the blade at the beginning of every spring. A dull blade will not only make your electric powered lawn mower less efficient, but it can also damage your yard. To clean the blade, you just need to wipe it down to remove any excess grass clippings that have built up on it. If you see your blade is dull, then you will need to remove the blade and sharpen it. If you see any damage or the dullness is beyond repair, then it might be time to change the lawn mower blade. Lawn mowers can generate a significant amount of vibration when they run. Over many seasons of using your electric push lawn mower, this can cause some of the fasteners and parts to come loose. When you are getting your corded electric lawn mower ready for spring, you should check all of the hardware to make sure it is tight. If you find anything that seems loose, use the appropriate tool to tighten it up. Your electric push lawn mower should have some air vents on the body. These vents help to keep the components from overheating when the machine is in operation. Just like much of the rest of this machine, the vents can get jammed up with debris, and this can limit the airflow to the motor and other parts. Some people use compressed air to remove the debris from the vents on the bottom of their corded electric lawn mower, but you could just wipe them down to get them clean. Think it’s time to trade in your old model for a new lawn mower this season? Check out the WORX collection and get yours today! Checking the power supply, clearing the deck of debris, changing the blades, tightening hardware, cleaning the vents. How to Water Plants How to Use Your WORX Aerocart Which Saw Should You Use for Your Next Project?